You will also need a compatible contactless smartcard reader. Depending on the make and model of reader used, Read-a-Card can identify, read and decode many popular card technologies, including MIFARE Ultralight, MIFARE Classic, DESFire, iClass and/or HID Prox card numbers. 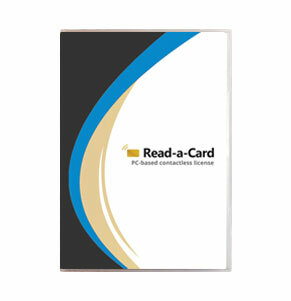 Note � this PC-based Read-a-Card license is most suitable if you plan to use several different types of reader, or if you are using a reader/configuration that does not support SAM or electronic licensing. The software can only be installed and used on a single PC and is supplied via a contactless activation tag, which uses 13.56MHz technology. The license cannot therefore be activated with an Omnikey 5025/5325 125KHz Prox reader. Once activated, it can be used to read HID Prox cards with these readers, as well as all other card types with any number of other readers.